The Mellanni Bed Sheet is our best bed sheet, which is made from polyester and microfiber material and is available in all bed sizes and a variety of colors to choose from. Mattress that are up to 16 inches high can be fitted with this deep pocket sheet type. Our step-up pick is the Sonoro Kate Microfiber and the design of the bed sheet keeps it from shrinking, fading and getting wrinkles easily. It also comes with a set for pillowcases so you can also use it for that purpose. It can resist dust mites, bad odors and the like. The budget pick is the AmazonBasics Microfiber Sheet and it is made from polyester microfiber that is comfortable and also stain resistant. It is a fitted sheet that can be fitted onto bed mattresses up to 16 inches deep. You can use it for a child’s room or for a dorm due to its durability. Sheets are also known as bed sheets, and are important in any bedding. Bed sheets can be used on any size of bed and may also be used for smaller beds and sleeping units. There are different kinds and sizes of beds so there are also many sizes of bed sheets that you can choose from. You should choose the appropriate bed sheet for the right job and the right size. Queen sheets and king sized sheets can be too big for full or twin sized beds, so make sure you know your bed size. In addition to that, specialty beds such as custom RV beds, sofa beds and the like may require a different and custom bed sheet for them. The material of the bed sheets should be durable and yet soft and easy to launder. Washing and caring for large bed sheets is always the challenge when maintaining any bedding, so it is a good idea to have a bed sheet with an easy care property so that you do not have to make it an effort to constantly apply certain steps in order to launder them the right way. Most bed sheets may also come in certain designs, especially if it will be for a kid's room. Whether it is your child's favorite cartoon character or a design they fancy a lot, it is also important that the bed sheet's design does not fade away easily. Bed sheets that are comfortable for your climate or weather are important to pick. For instance, cotton is good for hot summers so you may need something different for cold winters. Different materials for bed sheets just don't work out well in certain climates so you should pick the one that is the best for your area. This so that you can feel more comfortable every single night. A comfortable mattress or bed can be improved with a good bed sheet. Even if you do not have the budget to buy a high quality mattress, you can suffice and cover this up with a quality bed sheet that will make it easier for you to sleep comfortably in bed at night. Added with a good comforter and blanket, plus a nice set of pillows, you can get a well deserved rest after the day. Size of your bed: how large your bed is can determine the right sized sheet for you. Bed sheets can fit different sizes like King, Queen, Full and Twin sized beds. You have to know what size your bed is before you buy. Some custom beds are special like sofa beds and RV beds and they require different sheets. Bed sheet material: most bed sheets are made of fabric material but they can differ in type. Some have cotton while others have different kinds of sheet material. You should know which one to pick based on your climate. Some fabrics are better for tropical areas while some are ideal for four-season countries with winter. They should be comfortable and not itchy when you lie down. Ease of laundering and care: do consider a bed sheet that is easy to launder in the washer. Most sheets can be hard to take care of due to their size and bulkiness, but if you consider an easy care material then you do not have to go through different steps just to make it clean. Some sheets are easy to take care of. Thread count: a bed sheet can also have a thread count from 300 up to 900 and this can dictate the durability of the bed sheet. A good bed sheet should have a higher thread count so that it will be easier to maintain and can withstand years of use. Designs and color choices: some bed sheets are great for their design and color choices but they should not easily fade. The quality of the fabric can also dictate how long the design stays, as well as the stitch quality. If there are special wash conditions then you should follow them so they don't easily fade in time. Our best bed sheet is the Mellanni Bed Sheet, which is stain resistant and has properties that keep it from fading and easily wrinkling, due to the design of the material. It can be used on any kind of bedding and can offer a luxurious feel. If you want a lot of choices for the colors then this is the one to pick. It has a silky soft feel and is backed by a lifetime guarantee. While not a deal breaker, the Mellanni Bed Sheet does have a minor concern: they may not be ideal for those who like a crisp bed sheet. The Sonoro Kate Microfiber is our step-up pick, which has a depth of 18 inches for deep pocketed bed sheet needs. It is a hypoallergenic bed sheet that comes in three pieces and is made from Egyptian cotton. It has a good thread count and has a cozy feeling. Being an easy to launder bed sheet, it can be placed on a child’s bedroom or on any bed size. It has a soft finish and is breathable. The AmazonBasics Microfiber Sheet is our budget pick, which comes in various sizes as well as color choices. 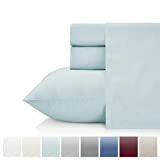 This bed sheet can be easy to clean and launder and comes with pillowcases for a complete set. It has a soft touch when you use it. The fabric for this bed sheet easily resists wrinkles and it is also great at insulation for you to sleep better in winter nights. The UHCBeddings Egyptian Cotton is made with a thickness of 18 inches and is a single ply. It is great for cold nights and is resistant to fading and wrinkling. It is ideal for luxury beds and is a 4-piece set with pillowcases. The HC Collection is also resistant to fading and wrinkling, and is available in a wide variety of size choices. It is hypoallergenic and comes with a pillow case set, and can fit mattresses up to 16 inches. It is made with double brushed microfiber. The BESTLINESTOYOU Bed Sheet is a fitted sheet with 2 pillowcases and a deep pocket design of up to 18 inches. It also comes with a flat sheet and is hypoallergenic against dust and pet dander. The Grand Linen Quatrefoil is a wrinkle resistant flat sheet and is made of brushed microfiber. It has a deep pocket design for comforters, quilts and the like and is available in different colors. The KRISTEX Sateen Weave is a cotton bed sheet that is great for luxury bedding. It has a sateen wave and is easily washable. Made with combed cotton, this bed sheet comes with 2 pillowcases and a set of flat and fitted sheet. The Balichun Bed Sheets comprise of a set and are all hypoallergenic and resistant to fading and wrinkling. There are different colors to choose from and it has a deep pocket design for high beddings that have comforters and the like. If you want an organic bed sheet then you should consider the Cifelli Home OrganicPro, which is made with organic Turkish cotton. It has a deep pocket design and has a 200 thread count and is GOTS certified for eco friendliness. Other sheets were not included in this list because they lacked in comfort, softness, durability and design. Others were also too difficult to launder due to the bulkiness of the material. A good bed sheet should be comfortable and easy to care for. Q: What are the different materials for a bed sheet? Cotton is the most common type of bed sheet that you can find anywhere due to its low price, soft feeling and ease of caring. 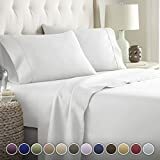 If you really can’t decide between sheets then it is the best to go for cotton first, since they are generally available, especially if you go for the medium to high quality ones. If you want to add a touch of luxury in your bed then choose Egyptian cotton. Soft and sheen feeling when you lie down on such a bed sheet. The most common and most affordable type of cotton material for a bed sheet or pillowcase. Flannel is a type of material that is best for cold areas because it traps body heat. Flannel is great for the winter and it is actually cotton but compressed and combed. Threat count isn't the way you measure flannel, but with ounces per square yard. Flannel is the best choice for the holidays. Tencel is a good choice if you want something that is natural and antimicrobial for those with certain allergies to synthetic materials. It is an eco friendly solution to those who want a bed sheet. It is good for cooling in the summer but not as much as regular cotton, so it is not that popular with areas that get super hot summers. Making Tencel is cheaper than the production costs of other sheet materials, making it environmentally responsible. Silk is a great addition to a luxurious bedroom, for a hotel or anywhere that is classy. It is made from silkworms, making it very expensive and delicate. Silk is a great bed sheet material for couple beds yet it should be cared for with great delicacy and you should prepare your budget, since it will most likely take a toll on your budget. Linen is ideal for tropical areas, highly hot summers and anywhere when you need a super breathable bed sheet. They are much like cotton so they are cheaper and usually have a lower thread count. 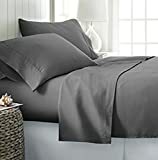 Most linen is used for blankets rather than bed sheets. Microfiber is a new type of sheet material that is ideal for those who want both softness and durability. They are great for highly damp areas and those cold winter nights due to the tight weave. If you want a stain resistant bed sheet then this is a good one to consider. Bamboo is a newer kind of sheet material that you don't always find on regular stores. It is actually bamboo rayon, or the material from the pulp of the bamboo that gets turned into sheets. While it looks like an eco friendly product, some processes in making bamboo derived rayon can be chemically made so it's not really environmentally friendly in some cases. The fabric is good for breathability, nonetheless. Jersey knit is a type of sheet that isn't woven, but knitted and is a blend of synthetic materials and cotton. It is measured in square yard instead of thread count. It is ideal for the winter due to the heat trapping qualities. Percale is a newer kind of bed sheet material that is a combination of a variety of fibers like silk, polyester, cotton and others. They are known for durability as well as a luxurious feel and design. Blended sheet materials, such as those with combine materials of polyester and cotton, bamboo and cotton, or rayon and cotton, can combine the best of both worlds. They are great for a kid's room and bed because they are usually better with breathability, wrinkle resistance and are cheaper to buy and may last for a longer time. You get the benefits of each type of fabric without a lot of stress on the drawbacks. Polyester is a synthetic type of bed sheet material, which is also cheaper, much like cotton. They are also super easy to launder but the softness and the breathability might not be the best compared to cotton. If in doubt, you can get a cotton and polyester blend instead. Satin is a combination of polyester, cotton, silk and the like and can be similar to silk in terms of luxurious feeling. It is ideal for those who need some comfort during the winter or cold nights. They are the best for luxurious bedding and are quite durable. Sateen (not to be confused with satin) is a newer kind of sheet material that is great for those who are prone to sheet allergies and want a mildew resistant bed sheet. They are mostly made of cotton and other natural fibers which make them more durable and easier to wash or launder. They look similar to satin but have certain differences in material. Q: What are the different bed sheet sizes that I can have? Q: What makes a bed sheet effective for my type of bed and other factors? Skin friendly materials such as cotton are the best for those with sensitive skin, or for those who simply want to rest well in the middle of the night without itching. Polyester is considered less of a choice when it comes down to being skin friendly because it is made of synthetic materials. However, there are certain microfiber varieties of polyester that make them softer. The type of cotton can also make it harder for you to decide. Different cotton types have different prices and qualities, such as those that are Egyptian cotton and those that are regular cotton. Egyptian cotton is the most expensive and Pima cotton is the next expensive. Upland cotton is the most common. It depends on the length of their fibers on how luxurious or soft they are. Thread count can also impact how comfortable a bed sheet is. However, having a higher thread count isn't what really counts. Some higher thread counts can mean that it could be bulkier to maintain, depending on the type of material that you have. Each bed sheet material can have a different ideal thread count (as we mentioned above) so you should know first before you buy a bed sheet with a specific material. How the bed sheet is weaved can matter. Some weaves are specifically stronger and yet can also affect the softness of the whole fabric. The weave of sateen is less durable but can be very soft. Percale, on the other hand, has a crisp weave, which makes it less softer but more durable. Cotton that is combed, or flannel, can be great for durability due to its combed design. Q: Instead of looking at the thread count, what else can I look for in a sheet? The kind of fiber that you use can matter, as different kinds of cotton as well as others like polyester and various fibers. Egyptian cotton is the most high quality of all and regular cotton is okay but less luxurious than Egyptian cotton. There are also bamboo and satin and many other kinds of fibers, each having their pros and cons. The kind of weave that your fiber underwent can make a difference. Some are weaved stronger so they are more durable, such as with a percale weave. However, they can also make them less likely to be breathable. Some have a more balanced weave such as those with high breathability with a cooler feeling during the summer. Where the bed sheet has been made might impact its quality. Other than the thread count, it is important where your fabrics come from. If they are imported from countries such as those in Europe, they are most likely to come from high quality manufacturers so they will most likely be better than those from other countries, even if they do have a low thread count. Price is a definitive factor when buying a bed sheet. Why go for a 700 to 800 thread count sheet if your budget can't afford it? Not all bed sheets are manufactured with the same quality so it's best to consider your budget first before you buy a bed sheet and make sure it is of decent quality for the price by testing it on-site. If you buy online, consider buying from one with trials or return policies. Eco friendly fabrics are still the best to consider. Some that were chemically processed might keep the shrink or wrinkle property to a minimum, but it is still the best to consider organic materials so that it will be safer for your bedding and will also be more allergy free than synthetic fabrics or chemically processed fabrics out there. Q: How does Egyptian cotton compare with regular cotton? Egyptian cotton is usually harvested manually and are handpicked so that you can be assured that they are of high quality beyond compare. Regular cotton may be machine picked but there are some that are also hand harvested. The price of Egyptian cotton can be more expensive than with regular cotton due to its material. Regular cotton is usually cheaper than Egyptian cotton and can be found anywhere. Egyptian cotton is only found on most specialty shops and malls and not in cheap bargain shops. You can find regular cotton mostly anywhere because of its wide availability, price and demand. Egyptian cotton is usually more flexible and softer than regular cotton due to its material weaving. Most regular cotton has just the right weaving type so they are less softer than Egyptian cotton. Most Egyptian cotton fabrics are more durable than regular cotton, hence they are pricier. Any regular cotton fabric can be durable but not as much as with Egyptian cotton. Egyptian cotton is generally more breathable than regular cotton due to the fabric weaving. Regular cotton is also breathable but Egyptian cotton is more breathable. The thread count of Egyptian cotton is usually more than regular cotton. The regular cotton fabric can be less when it comes down to thread count. Egyptian cotton can absorb colors better due to its purity. Regular cotton can also absorb color, but not as much as Egyptian cotton. Q: What are the differences between cotton sheets and linen sheets? Cotton comes from the cotton plant. Linen comes from the flax plant. Can be durable, but not as durable as linen fabrics. Linen is considered a very strong and durable fabric. Cotton is usually softer than linen. Linen can be rough at times but it doesn’t mean it’s not soft – it can get softer over a period of usage. Cotton is highly absorbent, which makes it a great towel material. Linen is also greatly absorbent, much like with cotton sheets. Cotton can keep you sufficiently warm during the winter. Linen can also keep you warm in cold days much like cotton. Cotton is great for reducing allergens in the air and in your bed. Linen also has some anti allergy properties. Cotton is very easy to launder. Linen is also an easy care material. Q: What are the differences between Egyptian cotton and silk? Egyptian cotton may not be as good as silk when it comes down to winter weather and keeping you warm. Silk is an excellent bed sheet to consider in really cold weather to keep you warm in the winter. Egyptian cotton is expensive, but not as expensive as silk. Silk is more expensive than Egyptian cotton in general. Egyptian cotton is handpicked from certain cotton plants that are not like regular cotton plants. Silk is harvested from silkworms, making them a lot more difficult to harvest in general. Egyptian cotton is found from, well, Egypt, as well as in neighboring countries that might have them. Silk is found in China because of the silkworms being in this country. Some other Asian countries may also have silkworms as well. Egyptian cotton should be machine washed in warm water. Silk should be machine washed in cold water and you should only use mild detergent to avoid decreasing the quality of the fabric. Egyptian cotton should be constantly washed since it is not dust mite resistant or allergy resistant. Silk is great for fighting against airborne allergies and bed allergies as well because it is mildew, mold and dust mite resistant. Egyptian cotton is okay for its moisture wicking properties. Silk is the best when it comes down to moisture wicking. Egyptian cotton is luxurious and comfortable if it has a high thread count and quality weaving. Silk is extremely luxurious and comfortable to sleep on, so most people prefer silk better. Q: How is regular cotton different from silk? Regular cotton is very cheap compared to silk. Silk is mostly for the rich people, since it costs more. Regular cotton is very easy to launder and take care of. Silk is hard to maintain because it is made with delicate fabric materials. Not very good with handling allergens in the air and on the bed. Very ideal for people with allergies as it resists, mold, dust and mildew. Regular cotton offers sufficient insulation but not as much as silk. It is, however, ideal for the summer. Silk offers the best insulation for both summer and winter, but works better during the winter. Regular cotton is comfortable but silk is better in softness. Silk is generally the softest when it comes down to material. Q: Is it possible to iron silk sheets? When you iron, use a lower heat setting on the iron. Whether it's a steam iron or an electric iron, it is important to use a lower heat because it will less likely to damage the fabrics, since silk is a very delicate fabric to consider. Alternatively, if you see a "silk" setting on your iron, you can use that, too. Just make sure you don't use too much heat on your silk fabric. Always iron as fast as possible. Make quick passes and don't let the iron stay in the same place. This needs to be done in a way that you wouldn't burn yourself with the iron, but make sure that it goes through to decrease wrinkles on your fabric. The back side of the silk sheet should be ironed. This can make it less likely to damage your sheet, because the back side is usually made to be more durable and less likely to tangle. The matte finish side of the silk sheet is less likely to get damaged compared to the shiny one. A cotton fabric on top can help reduce the damage when you iron your silk sheet. This makes up a sort of protective layer so that the iron does not completely go through the silk fibers. Just pick up any kind of cotton fabric that you aren't using or use a handkerchief to iron the top of your silk sheet. For steam irons, consider releasing the steam first before you start. This can potentially affect how you iron the silk and may lead to damage to both your iron and the fabric, so make sure you start with a clean iron in which the steam have been released. Q: How do I make my bedding hypoallergenic? Use natural fiber bedding. Some commercial bed sheets and bedding types have chemicals that may make you itchy at night due to its treatment. Sure, it is easier to iron because of its wrinkle-free coating, but if you find that you get allergies with such synthetic beddings then you can switch to natural fibers instead, such as silk, Egyptian cotton and organic cotton. You can also go for bamboo sheets, but with little to no rayon, since it's chemically processed. Q: How are flat sheets and fitted sheets different from each other? A fitted sheet is simply a bed sheet that goes over the bed and around its corners. It has elastic bands on each corner to keep it in place. In the old days, fitted sheets used to be fastened with safety pins, but with the emergence of garter, it has been since replaced. Fitted sheets need to be the right size for your bed size. A flat sheet simply goes over your bed only and not in the corners. 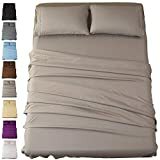 It is usually an optional type of sheet for most people because they simply make the bed more comfortable during the winter and can be incorporated with your comforter or you can use it as an alternative blanket. Unlike fitted sheets, you don't have to get the exact dimensions since it will be just a topper. Q: What is the typical range of thread count for bed sheets? · Those with 150 thread counts can be the cheapest of all. · Those with 500 thread counts or more can be more expensive. · Those with 1,000 thread counts or more are the most expensive but somehow unrealistic. · Those with 300 thread counts are the most ideal but it depends on your fabric type. Q: How do I dry bed sheets after washing them? · Consider not drying them out too much to protect their material, especially for delicate fabrics. · You can remove wrinkles simply by hand pressing them. · The top section can be ironed so that they can look neat when you place them on your bed. · If you can't remove the wrinkles, add a damp cloth and then soak it for up to 10 minutes or so and then straighten it out again. 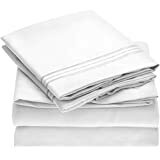 · As a precaution, you should quickly fold the sheets to avoid forming wrinkles on them. Q: How are bed sheets different from duvets, coverlets, quilts and comforters? A: While all of these things look like sheets that you can place in the bed, they are all distinct from each other and have a different purpose. The comforter is one of the most common types of bedspreads and can be made with down feather or even down alternative for those with allergies. Some can also be made with silk or wool. They can be uniform in design and may match your bedding. Comforters can have a wide variety of designs. The quilt is much like a comforter but has a combination of decorative "tiles" or patterns of squares that are all woven together. Quilts are great for traditional homes that want to have a fun an authentic style, whereas comforters are more ideal for modern homes and bedrooms. The duvet and cover is a kind of bedspread that works like the comforter but does not require a flat sheet, so it is great for those who don't want a lot of fuss when creating their own bed. They can be of different patterns and they are generally easily washable. A coverlet is either a woven or quilted bedspread that is lighter in weight so they are great for those who don't need too much layers in their bedding. You can use them both on a sofa and on a bed due to their versatility and are available in different designs as well. Q: How is a blanket different from a sheet? A bed sheet is something that goes over your bed mattress so that it will wrap and protect your mattress from getting stained and the like. A blanket is something that goes over whoever sleeps on the bed, and is meant to be on top of the bed sheet, or on top of other layers such as comforters, quilts, duvets, mattress toppers and the like. Q: What are the purposes of using bed sheets? · All bed sheets protect the lifespan of your mattress. · A fitted bed sheet keeps your mattress from getting soiled with stains. 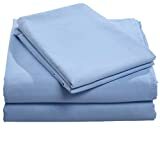 · A flat bed sheet keeps your comforter from getting soiled or stained. Q: If I don't have enough money to buy expensive bed sheets, how do I decide for quality? Go for a higher thread count for sheets, but not so unrealistic. At least 200 to 500 is an ideal thread count for cotton and similar materials. Sometimes, synthetic materials are better for those with allergic reactions, if you can't afford silk, which is usually more expensive. If you are buying flannel bed sheets, consider looking for "pre-shrunk" types because of the composition of flannel, which tends to shrink when you wash it later on. Cotton is best for the summer and are also very cheap. If you live in places with high summers then consider cotton because it is easy to maintain and cheap as well. Consider deep fitted sheets if you are using comforters, duvets, quilts and the like or have an incredibly thick or high mattress. Q: What are the different kinds of weaves? A satin weave is mostly ideal for thin threaded fabrics. They may not be that durable but they are great for comfort and softness. A percale weave is ideal for those who want durability, but some softness is sacrificed due to the crispness. They can be mixed with cotton, however. A flannel weave is great for those who want to stay warm in the winter, especially those with thicker weaves. Q: Does color matter in choosing bedding? White - for a stylish, classic and clean feeling and for better sleep. Light blue or sky blue - for a blissful rest and relaxation, for calmness, tranquility and for positive energy. Green - for relaxation, getting in touch with nature and emotional tranquility. Brown - complementary for most home furniture. Combine with green to have a natural design. Yellow and orange - for a cheerful and blissful feeling, filled with energy. Red - for passion, especially for lovers. Pink - also for lovers, but can also be mostly for women and for tenderness. Q: Which colors of bed sheets should I use for sleeping problems? A: For a relaxing sleep , you can choose any of the following colors to help you sleep better: blue, green and yellow. Avoid purple as much as possible, since it is a stimulating color that's great for creativity instead of relaxation. The Mellanni Bed Sheet is our best bed sheets that can give you a comfortable sleep at night, with many designs to choose from and has a deep pocket design of up to 16 inches.